Confused about Omega-3 and Omega-6? Not sure what the “good fats” are or what makes them so “good” in the first place? Tired of hearing about grams of this and grams of that without any reference to actual foods you actually eat? Here are some quick facts to set the record straight, no biochemistry degree required! Saturated fat is Paleo-approved – no, it doesn’t give you heart disease, or cancer, or diabetes, or anything else. 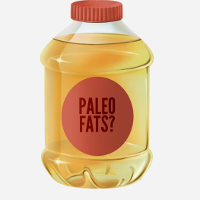 Monounsaturated fat is also Paleo-approved. Polyunsaturated fat is a little bit more complicated. It has two types: Omega-6 and Omega-3. Without going exhaustively into the details, aim to limit Omega-6 and get more Omega-3s (if you want to go exhaustively into the details, here you go). On Paleo, fat should be your major source of energy (calories). This won’t make you fat. Really. In fact, it’s much more likely to help you get (or stay) thin, because it’s a very satisfying, clean-burning fuel source. Fat from whole foods shouldn’t be avoided: keep those egg yolks, leave the skin on your chicken, and cook with real butter! Fish and seafood. Salmon, sardines, and mackerel are particularly good. Polyunsaturated: Omega-3s. Red meat. Fatty beef, lamb, duck, and other red meat is good for you! A mix of saturated and monounsaturated fat, typically in roughly equal amounts. Egg yolks Mostly monounsaturated and saturated. Industrial seed oils: canola oil, corn oil, peanut oil, soybean oil, “vegetable oil” (could be any or all of the previous). Margarine, “buttery spread,” etc. Real butter is good for you; fake butter is not. Excessive amounts of nuts or seeds. It’s fine to eat them; just keep it to about a handful per day. 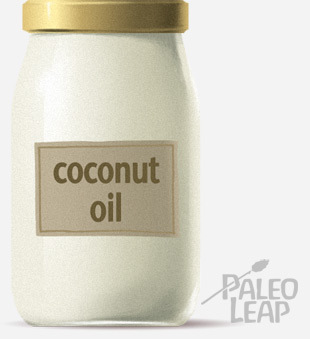 Coconut oil is a great Paleo cooking fat. Even for people who understand that eating fat doesn’t make them fat, it’s still a little scary to suddenly dive headfirst into the “demon nutrient” of the last two decades. Is it really OK to make soup with coconut milk – doesn’t that have too much fat? Is it really OK to cook with a whole tablespoon of butter? To eat all the egg yolks? To leave the skin on your chicken? Yes! It really is OK! In fact, it’s better than OK; it’s good for you. When you switch to Paleo, you’re cutting out a lot of unhealthy junk, but also a staple source of calories (grains). You’ve got to get those calories from somewhere else, and fat is where it’s at. 1, Don’t make any effort to remove fat from whole foods. Leave the skin on your poultry. If you’re going to include dairy in your Paleo menu, make it full-fat dairy. Make your omelets with the whole egg, not just the yolk. For example, if you’re having a salad with tuna (which is extremely lean), throw in some avocado, or use a dressing with plenty of olive oil. It’s fine to mix and match, and it’s also fine to eat more; this is a minimum, not a maximum. 3. On the other hand, avoid adding excessive or extreme amounts of fat to your meals. There’s no call to eat coconut oil off the spoon, do shots of olive oil, or deep-fry everything in lard. But this isn’t a huge problem if you’re eating whole foods. It’s actually pretty difficult to overeat fat from whole food sources because most people just stop wanting it after a while. Essentially, as long as you completely free yourself from all fear of fat “making you fat,” your taste buds and hunger will guide you towards appropriate amounts of fat. Breakfast: egg white omelet, apple. Lunch: grilled skinless chicken breast over salad with a tiny dab of olive oil for dressing. Dinner: steamed tilapia with broccoli. Notice how this person is removing natural fat sources from whole foods (using just the egg whites; skinless chicken breast), deliberately limiting salad dressing (a “tiny dab” of olive oil), and going out of their way to choose cooking methods like grilling and steaming that don’t involve fat. The fix: go back to the section above and follow the guidelines for adding a healthy amount of Paleo fats to your meals! Perhaps this person could eat the whole egg for breakfast, skin-on chicken breast with a generous amount of dressing, and some coconut milk sauce over the tilapia and broccoli roasted in olive oil. Lunch: ½ cup of soup made with leftover chicken and coconut milk; carrot sticks with .5 tbsp. mayonnaise. Dinner: 2 rashers of bacon with roasted cauliflower. Fat as a percentage of calories is perfectly fine – but this is a meal plan for an ant! The fix: eat all the same things; just double (for women) or triple (for men) the portions – at least! Alternately, add a few more healthy carbohydrates (“safe starches”) to make up the calories instead (you can learn more about Paleo carbs here). Hopefully this cleared up a few of the questions about which fats are good and bad. Really, once you let go of all the ways you might be consciously or subconsciously limiting fat, you’ll probably get enough all on your own. You don’t have to do anything ridiculous like shots of coconut oil: if you don’t skimp on cooking fat, use plenty of tasty salad dressing, and don’t panic about removing fat from your meat, you’re doing it right!